The Final 12 Exclusive GI Joe Collectors’ Club Figures All Revealed! 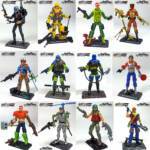 Here they are, all 12 from the Final 12 exclusive figures from the GI Joe Collector’s Club! Pre-orders will be announced soon! Sound off after the jump to share your thoughts on this eclectic set of figures.